With the impending arrival of a new baby any day now, I’ve been asked over and over again what I’m stocking away in my freezer and what types of meals I’m making ahead to alleviate the need for as much cooking later on. To be perfectly honest, I didn’t do a ton of freezer cooking for this baby. Part of the reason is because I have such a huge list of super simple “go-to meals” that our family loves and that I can whip up in a matter of minutes because I always have the ingredients in the house. Another reason is because Dave is home all summer and he enjoys grilling; so I just loaded up the freezer with burger patties, brat burgers, regular brats, hot dogs, marinated chicken breasts, pork chops, etc. Add in a lettuce salad, some fresh fruit, and corn on the cob and we have a complete meal without much work from me at all. We also tend to eat out more in the summer time — either at local restaurants, family and friends’ homes, community cook-out events, church potlucks, etc. etc. so in general, I find that I need to prepare fewer meals in the summer. This is probably pretty obvious — it’s one of the easiest meals to make ahead and freeze. And in my opinion, it tastes great as leftovers. In fact, I almost prefer lasagna leftovers versus the fresh-from-the-oven stuff! I love freezing casseroles because it’s everything you need for a meal in one pan — meat, starch, veggies, etc. 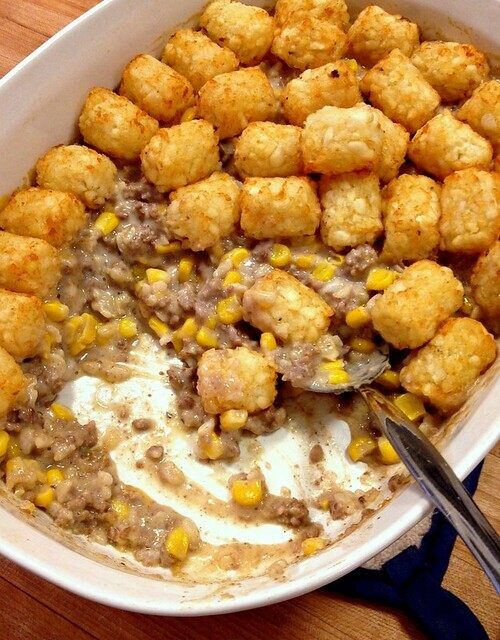 I know they aren’t the fanciest or most glamorous meal, but my family LOVES casseroles! Mexican Base Mixture (this isn’t really a casserole but I always keep it in the freezer for quick quesadillas, tacos, etc. 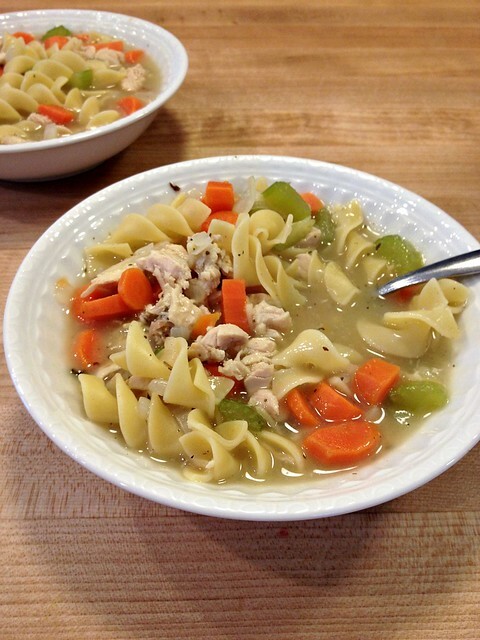 I don’t do a lot of soup in the summer time (I don’t have any soup in the freezer right now) but during the cooler months, it’s definitely one of my favorite make-ahead-freezer-meals. I feel like it’s just a no-brainer to make a double batch of soup since it takes the same amount of time/effort to cut up meat and veggies for a double batch. Plus, it’s such a quick weeknight meal to reheat. NOTE: While I do love potato soups and creamier soups, they never seem to work well for me in the freezer — which is why I didn’t include them in this list. Grilled chicken breasts, chopped into strips for salads, quesadillas, etc. Cooked ground sausage for pasta dishes, omelettes, quiche, etc. 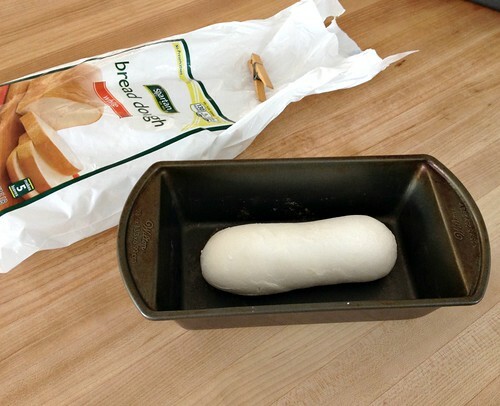 Frozen loaves of bread dough for Stromboli, fresh bread, rolls, etc. Of course, I also try to keep a good number of baked goods in the freezer, as well as lots of frozen fruit for smoothies and frozen chopped peppers and onions for omelettes, soups, casseroles, etc. There are definitely times when our freezer is more stocked than others, but for the most part, I try to keep a good rotation going where I’m adding new things to the freezer on a regular basis so we don’t totally run out. If you’re interested, here’s a post where I talk more about how I make my freezer cooking rotation work (without a ton of extra effort on my part). Oh, and if you don’t think you have enough freezer space to keep a nicely stocked supply of extra meals, here are some of my best space-saving freezer-cooking tips. And of course, here’s a link to all my simple, family-friendly recipes. 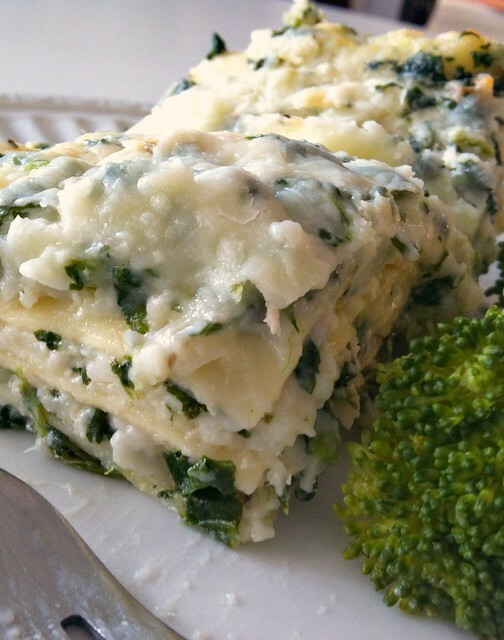 What are your favorite make-ahead-and-freeze meals? Where Do You Keep Your Small Appliances? I have frozen lasagna in the past with success, but never thought of freezing chicken noodle soup, at least not with the noodles in it. 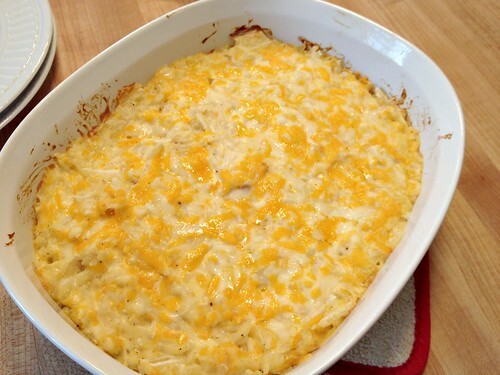 Also wonder how you do noodle bake things, do you mix them up, then freeze before actually baking? Yes, I freeze all my pasta dishes before baking them. Often, after I defrost them, I’ll add a little extra sauce before baking, just so they don’t get too dried out! How do you manage to cook with two little ones at home? When do you cook and how long does it take you to prepare meals to freeze for days? I work out of home and I have two children under the age of three. I find it difficult to balance my time with my children and doing all the household cleaning and cooking during the week. On the weekends I prefer having the time off to spend as a family, but mostly we run errands that I can’t get done during the week. I guess I usually just do it when Dave is home or during Simon’s nap (and Nora helps me). Also, I often just make a double or triple batch of whatever I’m making for dinner so it’s really not that much extra work to put 1 or 2 extra meals in the freezer. I honestly don’t “plan ahead” or make a huge grocery run. 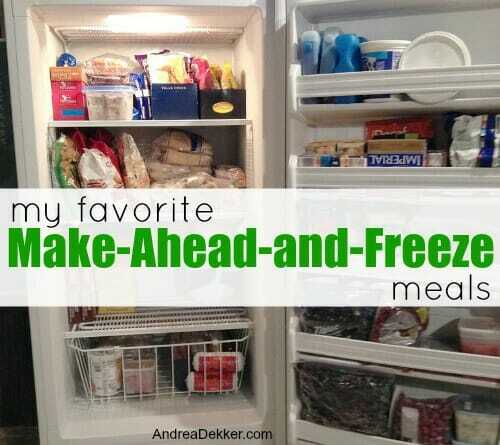 I just do a little at a time so my freezer always stays full. Ditto Andrea – one of the easiest ways is essentially increasing the amount I make. I make huge batches of soups, enough for 3-4 dinners (plus leftovers for lunches), and I make a gigantic stock pot of spaghetti sauce from scratch a few times a year (probably enough for 6+ dinners). Pasta dishes I intend to freeze, I double or triple, same w/ roasts. I also do things like that when I make meatballs and burgers -instead of 1lb of meat, I’ll do 2-3lbs, and then freeze what I don’t need right away, so that I can go into my freezer any time and pull out homemade stuff. 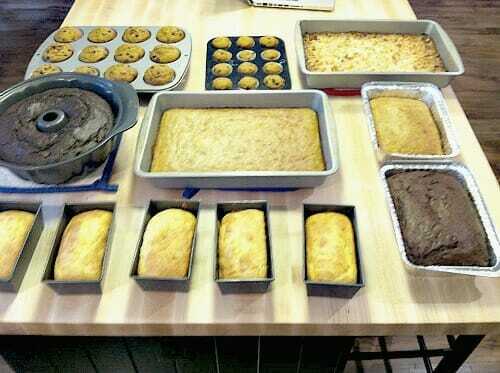 I will double bread/pancake/waffle recipes, and freeze extras. It leads to very little extra work and mess. 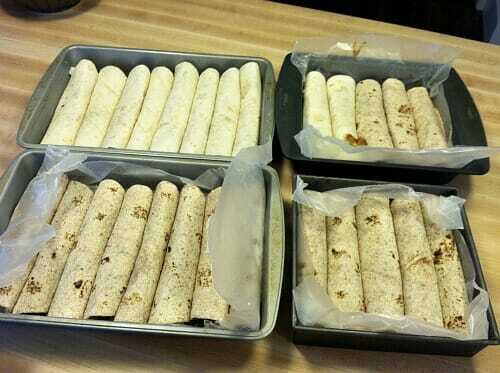 I just make to freeze in dinner sized portions for our family, plus some extra, as we like to eat leftovers for lunch. Since it is one of our favourite, we usually have pasta sauce at hand (ragu in the freezer and pesto jar in the pantry). And precooked shredded chicken – I find that it is the most helpful way to make and easy meal if I already have the chicken ready. 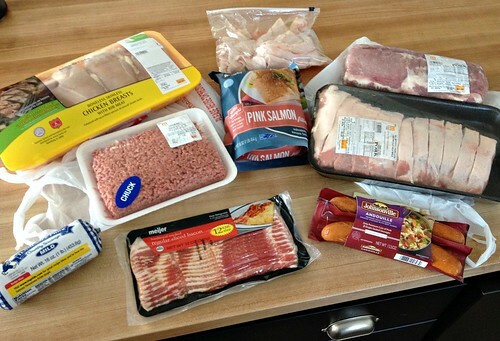 You mention “Brat burgers” in the meat grilling section of your post, but I dont think I have ever heard of these…. What exactly is a brat burger?